This week, a few members of the LSF staff were invited to a screening of “Last Flag Flying”, starring Steve Carell, Bryan Cranston and Laurence Fishburne, from Academy Award-nominated director Richard Linklater. The film tells the story of three Vietnam war veterans, a former Navy Corpsman Larry “Doc” Shepherd, former Marines Sal Nealon and Reverend Richard Mueller, who reunite after 30 years to embark on a cross-country trip to bury Doc’s son, a young Marine killed in the Iraq War. We were honored to have the opportunity to interview Executive Producer, Thomas Wright, along with Darryl Ponicsan, the novelist and co-screenwriter of the film, and Wright’s wife, Alexandra, a psychotherapist who works with clients dealing with Post Traumatic Stress. Thomas Wright’s father was an Air Force officer and flight instructor during the 1950s, and Ponicsan served in the U.S. Navy in the mid-1960s. o A main theme in the film is the bond formed during military service. Can you speak to how that brotherhood is important for those returning home? DARRYL: I can only guess. It would be like being in a strange land and finding someone who spoke your language. The irony in the movie is that these guys went their separate ways decades ago and tried to make the most of their lives. Only in extreme crisis did one of them seek out the others, knowing they would be the only ones who could take this on and know what it was all about. ALEXANDRA: I think that brotherhood is an existential issue for men in the military. The idea of patriotism is abstract, but real flesh and blood next to you in the chaos and under duress is what provides meaning. THOMAS: For my father’s generation, military service was a given. He joined the Air Force with his closest friend and they remained best friends for a lifetime. o Can you speak to the importance and effect of multi-generational service as it played out in the film? DARRYL: Some things are universal, not subject to changing times and different locations or battle stations. Duty, for instance, is a constant. As is pride. It is good for a new generation to learn that what is true for them was true for previous generations. ALEXANDRA: Regarding multigenerational service, a legacy of fathers, uncles, grandparents etc. can be inspiring to young men. Each generation has their war: some wars have more legend and honor than others: compare WWII to Vietnam or Iraq. Service in war-time is one way to become a man, a rite of passage. THOMAS: For “Last Flag Flying” Director Richard Linklater, whose father served in the Navy, the intergenerational aspects of this story were one of the keys to his wanting to be involved. Throughout all of his films, Rick continually returns to the theme of time’s passage and its profound effects on our human condition. The young Marine in the film, played by J. Quinton Johnson, definitely holds his own in the company of the older Marines. They learn from each other and respect one another. Rick came on board because he loved these characters from two different generations. They came alive for him. The story is a compelling reflection of these two wars. Rick has said that for him the story is “like a meditation on time, mortality, and middle age”. o In the film, Doc, Sal, and Mueller all struggle with a painful memory from their time in service, something that they have carried with them for 30 years. Can you speak to the impact that had on their lives following their service? DARRYL: In the movie each of them tried to resolve it as best he could. Mueller found God and devoted himself to the service of others. Doc served his time and tried to lead a normal, decent life. It is important to know that only Sal feels strongly about the need for confession and some kind of absolution, which he never gets. ALEXANDRA: Guilt and any experience that continues to disturb or is unresolved is actually a definition of trauma. Once guilt is addressed, trauma can be resolved. Guilt is an aspect of all trauma and thus of all wars. THOMAS: Bryan Cranston, who plays the character of Sal, believes strongly that soldiers who fight in different wars have far more in common than they have differences. The courage, fortitude and dedication required of all are the same. Still, even as his character acknowledges the heroic qualities they all display, in the same moment we must show them the respect due to each man as an individual. Darryl’s definition of a good soldier is simple and memorable: a good soldier is someone who is willing to sacrifice his life but not his soul. o The veterans returning from Vietnam did not receive the honor and benefits due to them for their service. Their reception back home led to compounded trauma for many. How was this compounded trauma reflected in the film? DARRYL: No matter how bad it was for them on returning—and we never see or know about that—they sucked it up, and though they may have rejected everything else about their time in the Marines they could not let loose of their sense of honor and their satisfaction in knowing they took on what others avoided. THOMAS: I think it’s safe to say that the film has been especially impactful for the Vietnam generation. Vietnam veterans have been very vocal and emotional in their support of this picture. 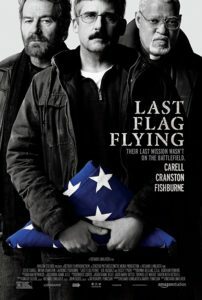 I think that is because “Last Flag Flying” allows them to begin to talk about things they have never publicly discussed. We have heard over and over again, after preview screenings for military audiences, that conversations are taking place in many households that have never taken place before. o Lone Survivor Foundation offers therapeutic retreats for service members and their families who are struggling with Post Traumatic Stress, mild Traumatic Brain Injury, Chronic Pain, and Military Sexual Trauma. Had services such as these been available to Doc and his buddies when they retired, how might they have benefited? ALEXANDRA: I think Doc, Mueller or Sal would have had to encourage one another to access Lone Survivor Foundation’s services. Maybe Doc would have gone in on his own. But Sal for many years finds refuge in alcohol and Mueller in God. Still, if they made it to the door and someone’s there to greet them, they might still walk inside. THOMAS: For Rick, this is his own personal kind of war movie. He has “never been interested in making a mission-based, heroic movie”. To Rick, he’s got no interest in explosions or gunfire in the telling of a story. As he states in a recent interview – “The stakes weren’t so big – we weren’t trying to say, “This means everything.” as much as we’re saying “This is what it means to these three guys, and this is what they went through.” Three guys who had served, and are dealing with a new war under some of the most tragic circumstances imaginable. The services that Lone Survivor Foundation provides can clearly help a man or woman survive this second war – the challenge a warrior faces upon returning home. It’s a transition as well as a very personal transformation. Learning how to care for yourself again in the best way possible – that’s the most important mission that any of us can undertake. Thank you to Thomas, Darryl, and Alexandra, for your time and for your support of our nation’s service members! Our retreats emphasize the use of Equine Assisted Learning (EAL) using the EAGALA model, neurofeedback, combat trauma specific yoga, and other cutting edge modalities geared toward improving quality of life. We empower our retreat attendees with the skills and resources necessary to create a plan for their continued recovery after the retreat. Through our referral network, we can connect them to organizations and providers in their local area who can assist them in continuing the therapeutic treatments they have selected to pursue. Through the plan they created and the resources we provide, the retreat attendee will be able to take ownership of their healing process. Individuals are welcome to come back for a Couples Retreat, followed by a Family Retreat (usually 6-18 months apart), depending on their individual needs and progress. All of these services are provided at no cost to the service members or their families through the generous support of donors, sponsors, and through fundraising events around the country. next post: The Bull’s Ten Man Jam – Raffle Winners Announced!